What functionality will it need? Will it be better to optimize it for iPad or Mobile or Desktop? What articles on your site will attract the most attention? 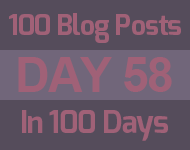 How many blog posts will you be writing a month? How much do you need to spend on social media? "You can't join the dots looking forward, only looking back"
While planning is good, you can't possibly think of everything. So don't worry, just take it one step at a time. If you get a website with Onsitenow we can work out a monthly payment plan, and you can add features as you need them, when you realise you need them, so you can join the dots looking back.